A lifetime of faith starts with one great story... Jumpstart a lifelong love of the Bible in your children. 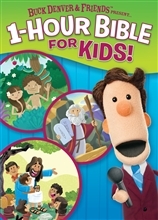 1 hour Bible for kids! Clive and Ian - Volume 1: 6 BIG questions about GOD! Clive and Ian - Volume 2: 7 BIG questions about GOD! Buck Denver Asks..."Why do we call it Christmas?" You've probably heard the Christmas Story... but have you heard the Story of Christmas? Buck Denver has a simple dream - to save the galaxy. This 4-week Easter journey celebrates Easter with joy.